But make sure you do it right. If you’re looking for a second PC, a compact gaming box, or an upgrade from an ancient rig that coughs out dust and grinding requests to be put out of its misery every time the fans start spinning, you might be tempted to take out a new credit card and a lien against your home to afford the latest gear. But accepting a small amount of compromise means you can build a new rig that will muscle through the majority of top games and won’t cost the earth—in fact, it could cost less than a console and do a better job. But what compromise? The first is accepting that you don’t need a monster GPU. You also don’t need a super-modern CPU, particularly if you’re leaning toward gaming. Previous generations still have a lot of muscle left, and they’re common enough that they’re ripe for exploitation. The other big compromise might sting: You’re going to have to drop your aesthetic aspirations. Tinted windows, pretty RGB accents, and gorgeous water-cooling layouts are all well and good, and we won’t argue that they don’t play a big part in the allure of the modern PC, but they cost money we simply don’t have to spend. Our plan means settling for a machine that’s more functional than fancy, something that gets the job done with no fuss and no expense other than that which is strictly necessary, and that often means a no-frills black box. Put those cares aside, pick up the right components, and you’ll have a highly serviceable and fundamentally decent machine. You won’t get any sort of forward upgrade path, but for the money, who’s complaining? Be careful when searching by brand: All four of these machines are labeled “Optiplex 9010,” but they’re very different. Want to build from scratch instead? Check out these guides. Used hardware can be a minefield. Head to Craigslist and search for “gaming PCs.” You’ll see a bunch of plasticky monstrosities that are definitely showing their age, you’ll find some unrealistically priced machines that are clearly either not as described or hotter than a three-dollar bill set on fire, and you’ll find incredibly well-heeled and burned-out boxes from people desperate to recoup some of the investment they’ve made on a new PC. They’ve upgraded because that old PC isn’t just a few steps behind—it’s at the end of its life. We recommend looking in a different direction: at office PCs that have outlived their leases. Yes, they’ll have been well used, but they’re unlikely to have been thrashed. 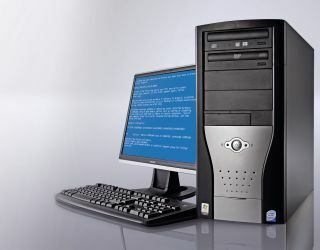 And office PCs, previously operated under service contracts, are made of enterprise-class components guaranteed to work well together and for a long time. There are thousands of these machines kicking around, cast off in floor-wide upgrades, and the good news is that the current crop packs some pretty mean hardware. There’s a bunch of brands to look out for, but the key spec to watch out for is the CPU. Ignore first-gen Core i3 or i5 chips as, while they’re OK, the price difference in machines toting second or even third-gen chips is negligible at best, and later processors and chipsets include technical upgrades beyond just speed. Even a Haswell CPU might be on the cards (our particular example machine, packing a Core i5-4590, was a steal), but they’re less common in this class, and you should expect to pay a little more. Don’t, whatever you do, opt for an old office box with a Core 2 CPU or a Pentium. They’re utterly inadequate, even if you’re just looking to put together a new media center. They’re not worth the silicon they’re etched out of, particularly given that there’s no way you’ll be digging up a Kaby Lake Pentium, which actually moves pretty fast, when you’re looking in this bracket. Office machines can be easy to work on, as they’re built for quick servicing. There are several avenues to follow if you’re looking for an ex-lease PC. First, eBay, which is a vast repository of older hardware. Use all the tricks. Filter by the specific level of CPU you’re looking for, by machines with 8GB RAM, to save you upgrading later on, and by the machine’s designation—look for “refurbished” rather than “used.” Check the listings. Scour through them, and read the descriptions; if a seller hasn’t even bothered to check out the specs of a machine and type out an informative listing before trying to flip it online, they don’t deserve your business. Amazon is a good place to look, as many resellers lurk in its underbelly, but prices tend to be a little higher there. Perhaps the best option is to seek out a recycler or reseller close to you, or go to the source, like a local office IT department. If you can see a machine working before you buy it, all the better, and collecting yourself reduces cost and negates potential shipping nightmares. Nobody wants to receive a PC in several pieces. Wherever you shop, be frugal. We can’t tell you precisely what to pay, because that depends on your budget and what’s floating around at any particular time, but saving a buck or 20 is the whole point of this exercise. Don’t dodge a bargain just because it looks too good to be true. The second-hand market is volatile, and different sellers have wildly varying ideas of the value of their stock. Perusing eBay quickly reveals the sort of prices you don’t want to pay. Tattered it may be, but a COA sticker is your path to a legit copy of Windows. There’s a stack of potential pitfalls that come with buying a second-hand machine, some of them avoidable, some of them not so much. Let’s start with Windows; make sure you get a machine with a legitimate install on board, and preferably one with the COA sticker still glued to the PC’s case. You’ll likely come across a lot of hardware that originally ran Windows 7 or Windows 8.1—ensure from the seller that the key on the box has been properly transitioned to Windows 10, and is the same key used in the install on board. A legal copy of Windows 10 forms a big part of the value of these machines; often they can be found for less than the cost of a retail Windows 10 key. Next, ensure that the PC you’re buying can do what you want. This means a whole lot of research before handing over your cash. Dig up the original datasheets, look at images online of the case opened up, research every last detail. If the PSU is proprietary and offers little to no overhead, steer clear. Maybe it’s fine, but the PCIe slot can’t supply enough power to juice up a decent GPU. Perhaps, as we learned to our peril when purchasing our example machine, the CPU supports VT-d instructions, but the chipset on board the proprietary motherboard does not. Thoroughly list your requirements and check them off one by one—don’t miss any, or you’ll shed a tear or three when you go to start up a virtual machine, and find it can’t use your GPU. Ahem. If the machine doesn’t quite match your specs, consider how difficult it will be to bring it up to speed, and whether it’s worth stepping up, or buying cheap, then upgrading later. You could, for example, save a little hassle buying a PC with 8GB RAM or more, but check the prices of upgrades, and compare them to machines with less RAM. Just as there are stacks of these machines on the market, there are stacks of components from machines that have been parted out for profit; go back to those copious notes you made to ensure that what you’re buying is compatible. An SSD makes a vast difference in teasing a feeling of speed from an older machine. A little extra RAM is essential, and it’s just the tip of what you can do to these machines. You’ll want to do all you can to compensate for the inherent weaknesses of an aging office PC, particularly the processor being a few steps back from cutting edge. But, alas, you’ll likely be working with a very limited platform. So what can be done? First up, grab a SATA SSD for the operating system. It doesn’t have to be huge or outrageously fast, but you must buy new—who knows what hellish barrage of read and write cycles a used one has been through? Mass storage may also be a potential upgrade, particularly if your machine comes with a measly capacity, as this category so often does. If you don’t replace the spinning hard drive, consider it expendable: its lifespan will have been significantly reduced by wear over time. The upgrade component that really gets an office PC cooking (perhaps literally, if you’re short on case space) is a new GPU. This is, as you’ve likely guessed, the reason that buying an old PC for gaming makes any sense: That dated CPU might let it down, but the vast majority of modern games lean more heavily on graphics power than they do on the processor. You’re building a PC with a known bottleneck, but one with surprising ability for very little money. Gigabyte’s GT 1030 is single-slot, low-profile, and cheap: perfect for an ultra-budget gaming box. Unlike the other stock upgrades, it’s important to cater your choice of card to the capabilities of your sourced hardware. If you’ve bagged a small form-factor case, you need to consider the space available (see “Factoring in Form Factors,” left), while tower cases, however peculiar the motherboard may be, are generally flexible and roomy enough to house any card. It’s not worth skimping on this aspect, particularly given that there’s a limited number of cards that are suitable for use in this category—you are unlikely to find an office PC with a six or eight-pin power connector coming from its PSU. That’s just not a thing that happens, so you need something bus-powered, drawing within the limits of your PSU’s remaining wattage, which cuts down the options somewhat. Even the lowliest machine should be able to handle the Nvidia GeForce GT 1030. It’s tiny, often available in low-profile half-height form, and there are versions, such as Gigabyte’s fan-cooled $78 card, that have a single-slot footprint. Other variants include passive cooling, although this generally necessitates heatsinks that extend over more than one slot. Check not just the card width but its length, too—if you’re dealing with restricted space at the end of the slot, something stubbier, such as MSI’s Aero ITX ($118), would likely fit the bill. The GT 1030’s key asset is both its price, which can dip below $70 if you look at the right time, and the fact that it demands only around 30W through the PCIe slot in order to power it. It may peak slightly higher, so make sure you have at least 45W capacity remaining on that PSU after the rest of the components are taken into account. The GTX 1050 Ti offers up some serious muscle and doesn’t demand a huge amount of wattage. The GT 1030 can game, to an extent, and it’s a great option if you want to keep your budget to a minimum, but it’s better suited to video encoding and multimedia efforts. Providing you have around 60W PSU power to spare, the GTX 1050 Ti is a far stronger choice. It’s more expensive—at least $200—but if you’ve saved enough on the base machine, you’ll still bring home a box that packs some serious muscle for potentially under $300. There are smaller versions (check out the half-height MSI variant), 2GB and 4GB editions, and overclockable variants, but don’t buy the latter expecting to push it too far. The GTX 750 Ti is another strong option, although since it’s been retired, you’ll need to unearth a used one. On the AMD side, you could hunt for the RX 460, another card that’s been canned, but it’s a pricey option even second-hand. The RX 560, still in production and decently priced at around $140, is a perfectly powerful card, but it typically pulls the full 75W from the PCIe slot, so a 400W PSU is all but essential—a rarity in office machines. We’re not saying Nvidia is your only choice but, in this context, it’s probably the only good one. When you’ve got it, you don’t need a step-by-step tutorial; just slot it in. It’s the easiest upgrade you’ll ever do. And when your GPU is installed, you’ll have a machine that’s far greater than the sum of its parts. Commercial machines use proprietary motherboards with unusual layouts. Three manufacturers are responsible for the majority of office PC supply: Dell, HP, and Lenovo. Dell’s Optiplex line is the one you’ll see most often, and its ubiquity means it’s usually the most reasonably priced. Look to pay around $100 for an Optiplex 790 packing a second-gen Core i5, or $10–$20 more for an Optiplex 7010 with a third-gen chip. The internals are great to work with, and they’re covered in USB ports. And that pierced gray accent panel? That’s actually pretty nice. Next up, HP, and its sub-brand Compaq. If you can find an HP ProDesk (the model we bagged while researching, for around $170), you’ll get at least a fourth-gen chip, although the smaller form factor models are so tightly configured they’re not worth your time if you’re planning to upgrade. The Elite line is generally a great deal, at around $110 for an Elite 8200 with a Core i5-2400. Shop around, and you may be able to find the step-up 8300, with an i5-3470, for a similar price—cast scorn at those trying to get $400- plus for them, for they are fools. Lenovo’s ThinkCentre line is less common, and the more compact designs can be tricky to work with. If you do go for an Lenovo, the M72E tower, around $140, is a decent third-gen base with plenty of room within to work. Other brands do produce business machines, but can be hard to come by; Acer’s Veriton line is probably the fourth most common commercial desktop, though your options are limited, and it’s very rare to see AsusPro boxes on these shores. The vast majority of ex-office PCs come in SFF—small form-factor—cases. They didn’t need to be gigantic for the job they were designed for, but it does mean you’re going to have to think about what you’ll be able to achieve. The case design is often fantastic for quick maintenance; generally hard drive and optical drive caddies are screw-free, the case itself opens in seconds, the RAM slots are easily accessible, and there’s no excess wiring to worry about. But you’re stuck with half-height cards, and it’s imperative that you check the position of the PCIe slot before buying the PC or a graphics card. All too often, it’s located in such a position that only single-slot-width cards work, and so close to the PSU or the side of the case that adequate airflow is impossible. You may also see USFF PCs, even smaller than SFF. These aren’t much good for us, as they don’t have any space or slots for expansion. There’s a way to add external graphics to them, sure: If you find the right cables, it’s possible to string a wire from a mobo-mounted mini-PCIe socket to an external PCIe card slot. But don’t buy a PC expecting to do this. It’s impractical, awkward, and silly. Keep an eye on eBay listings—if one is dealing with multiple lots and says you may receive an SFF or USFF edition of a PC, walk away. Look for a tower case. The extra space makes them worlds easier to work with. So, you’ve got your PC home, and picked up any additional components you need. Don’t rush into anything; this is a second-hand box, and you should treat it with suspicion. Contain your excitement, and inspect the internals thoroughly, making sure every cable is properly attached, and everything looks as it should before plugging in and powering up. Run the machine without your upgrades first, to ensure you won’t fry any new components, then add them once you’ve stress-tested the base model for a while. Depending on where you’ve picked it up, you may be forced to refurbish the PC yourself. This isn’t difficult—it’s just a case of giving it a good clean—though be prepared to take it outdoors with a can of compressed air, because something that’s been running on a desk for five years is likely bursting with dust. Remove and hose down any heatsinks, allowing them to completely dry, to ensure they’re as effective as possible. Replace the thermal paste on the CPU, and reseat everything to ensure a solid connection. When you start up, check to see if Windows automatically logs on to an existing user account. If you’re sent straight to the desktop rather than the first stage of Windows 10’s setup process, your seller hasn’t done their job properly. You’re probably going to want to reset the OS and start from scratch, because that cut-price machine could well be serving as a trojan horse from an unscrupulous individual. You might never know if there’s a keylogger—or worse— preinstalled in that user account. Resetting Windows should put everything back to defaults.